In a world where seemingly every political figure compromises with dirt, an Elizabeth Warren and a Bernie Sanders ticket makes sense. Elizabeth Warren all the way!Hillary does not stand a chance against this lady.She is too close to the banks that crashed the economy.Sorry Hillary but you don't have the guts to do the right thing by the American people. It ain't gonna happen for Warren. People like to compare her to Obama as the hidden gem in the Dem party. However, Obama had his over the top convention speech to catapult him into the limelight. Warren hasn't had that chance but she could in the convention that nominates Hillary. Besides all that, Warren looks too much like a Northeast Harvard liberal which would be really tough for the red state people to swallow. She is darn smart, speaks well, has good ideas but she'll need a visual reset to sell herself outside of Mass. Pres. Clinton ought to give her a cabinet level job to increae her visibility and get her ready for the world stage. When are you going to get help? Surely, you have obamacare by now to get help for your sick postings, or were you one of the persons who found out they don't have obamacare insurance after all because it is so screwed up. BTW, did you know the premiums are going even higher and higher? Are you ashamed of your party's Mantra? (originally in Hinduism and Buddhism) a word or sound repeated to aid concentration in meditation. a Vedic hymn. a statement or slogan repeated frequently. NOPE: BUT YOUR PARTY IS ASHAMED TO HAVE SUCH AN IGNORANT, SICK, HATEFUL, SPITEFUL, WIMP, GOVERNMENT LEECH, WHOSE IGNORANT, SICK, HATEFUL, SPITEFUL, WIMPY, GOVERNMENT LEECH MONEY SUCKING TAKER FROM POOR PEOPLE, IS IGNORANT, SICK, HATEFUL, SPITEFUL, WIMPY, AND TYPICAL FOR A GOVERNMENT LEECH MONEY SUCKING TAKER WHO TAKES MONEY FROM THE POOR BECAUSE YOU ARE A IGNORANT, SICK, HATEFUL, SPITEFUL, WIMP, POOR PEOPLE BLOOD SUCKING GOVERNMENT TAKER. A reply to "The GOP Solution", who is a GOVERNMENT LEECH MONEY SUCKING TAKER WHO TAKES MONEY FROM THE POOR BECAUSE YOU ARE A IGNORANT, SICK, HATEFUL, SPITEFUL, WIMP, POOR PEOPLE BLOOD SUCKING GOVERNMENT TAKER. Your sick sh. It is getting old, you GOVERNMENT LEECH MONEY SUCKING TAKER WHO TAKES MONEY FROM THE POOR BECAUSE YOU ARE A IGNORANT, SICK, HATEFUL, SPITEFUL, WIMP, POOR PEOPLE BLOOD SUCKING GOVERNMENT TAKER. Hillary not win the democratic nomination. Impossible, after all the liberal media have been telling us she is unbeatable. And that is what the MSM was saying in 2006, until Obama came on the scene with a real opportunity. Clinton will NOT get the DNC nomination. IF it is a female, it will probably be Elizabeth Warren, but that is still a big IF. Oh please say it ain't so, possibly no Hillary nomination? It can't be, oh no, it must have been a video dream. Surely, CNN is joking , She is the greatest democrat even remotely possible to go against any Republican, that's what all the liberals and liberal media has been saying for months and months. Oh! No! No! No! Amazing. Progressives have finally found a candidate so bad that I would vote for Hillary Clinton. Excellent call out. We now have a one party system. The system of government. Warren would be no better either. The more interesting question for me: "Who's going to come along "from nowhere", and knock Hillary out of getting the Prez Nomination in 2016, like B. Obama did in '08"?! Now that is the 64-dollar question. Don't believe E. Warren can do it. They (detractors), believe that Hillary has "too much baggage"? Have they looked at E. Warren? Don't believe so. As a "purported" "Native American" (stated on her college entrance app, to get "favorable" advantage in being accepted into college – didn't sit well with those folks who believed she took unfair advantage of other applicants. Might or might not have been true, depending upon "getting tribal distribution of money/etc., based upon percentage of native american blood/heritage that the recipient qualified for. Those "touting" E. Warren might need to "rethink" whether she can overcome that and other things from Elizabeth's past that will come back to haunt her. Not a particular "rosey" picture. Clinton is only in this for herself – She definitely isn't in it for the American People. Hillary is a Radical Right-Winger, Warren is my choice. 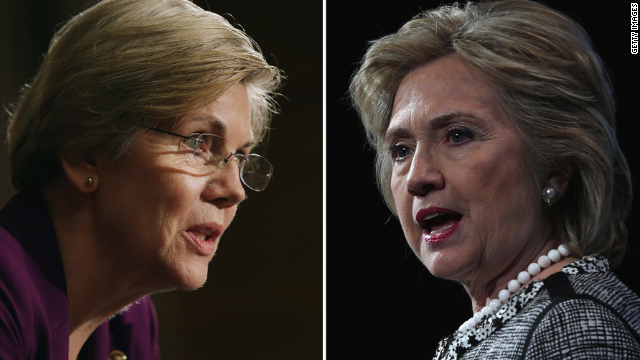 Could Elizabeth Warren beat Hillary for the Democratic presidential nomination? A Chicago "community activist" turned 2nd string thug politician beat Hillary! Have either one of these two every done anything? You know, like hold a real job or meet a payroll? I know the Clintons were "dead broke" but Hillary managed to pull her family out of financial ruin with 2 phone calls....maybe she could do the same for the nation. Warren is about as electable as Ted Cruz. HHAHAHAHA Put the crack pipe down, she would destroy the base. I'm a Rep and I am not stupid. I want her to run out of all of them, she is the one that's attacking corp America. No one in congress, the president, or Hill. She is the only one. You want her in office. You need her in office, She would be the one to keep the checks and balances. WOW some people. Although Cruz and Clinton are both Free-Traitors and Warren is Not. I wouldn't vote for any of them, especially not Hillary or Cruz. The American People deserve much better choices. The problem in trying to elect good leaders for The United States of America has nothing to do with the color or gender of our politicians. – It's our politician's, from both parties, lack of honesty and the lack of willingness to do right by the US citizens that they're elected by and should be representing. I wish we had someone like Ross Perot running again. If more people would have listened to Ross Perot back in 1992, America wouldn't be in this mess right now. I and many other people, who were able to see through all of the left vs right BS, did vote for Perot, because he was straight forward and just used common sense. He cared about his country and the American people. If I had to chose, I'd pick Warren hands down! Think about it – Why is Hillary constantly in the news? – Seriously every where you look the amount of "news/pep-rally" stories on Hillary are unbelievable – Every time you look, there are more and more and more – When is it going to stop? – This lady is rotten to the core and this is coming from someone who thinks both parties stink. – I don't trust the liberal media or FOX, because all they both do is to try and continue to polarize and distract the American People, while they're puppet-masters are screwing us right down the middle. Now they've even got an upcoming CBS series called Madam Secretary starring Tea Leoni that is yet another obvious prep-rally and propaganda tool to promote Hillary. – Do they really think that the American People are that stupid? What ever happened to: "We The People" ? Why is the media so infatuated with this evil-unethical-disingenuous-dishonest-power-monger? Wake up America! – Who's been pushing so hard for her and why? It's Hillary – Hillary – Hillary 24 / 7 / 365 – Hummm? The American People deserve leaders that will honor the fact that they are elected by the Citizens of the United States of America to represent the interests of those citizens and the country itself and that They are NOT Elected By or To Represent Lobbyist, the Global Marketplace (WTO, NAFTA, TPP), Foreign citizens or Illegal Aliens. And the Vince Foster incident and many others like it should not be forgotten. Hillary hasn't accomplished anything other than using the Monica scandal to leverage the Dems for future power. The American People need to ask themselves: Who's been pushing so hard for her and why? I truly believe that she is evil. And that's certainly not Hillary, who's just a wolf in sheep's clothing. Nice try China – How dumb do the Clinton pushers think that Americans are? This is an Obvious BS Spin to try and get Americans to forget that Bill and Hillary Clinton are two of the biggest FREE-TRAITORS around. Before Hillary Clinton runs for president, Americans need to remember that it was her "husband" that got us into bed with China in the first place. – And how's that been working out for the American People and the Real American Economy? I don't trust the Clintons at all. – It was the "Clinton Machine" that kicked the ball over to China, which got the Real American Economy rolling down the hill. Nixon only restored normal diplomatic relations between the US and China, but Clinton is the one who opened up the trade floodgates with Communist China. And both Bill and Hillary were actively involved during their visit to China. The American People need to ask themselves – Who's been pushing so hard for her and why? Sorry, I left in that extra comment in there from when China wouldn't sell Hillary's book to make it look like they're not pushing for her. The Wicked Witch of the North and the School Marm. Neither one. We ALL have a immigration story; What's yours ????? Nope but proud to be a conservative and sad our nation has been screwed by obama and the democrats!